Casualty and theft losses can contribute to a tax deduction for damage and losses due to fire, accident, or a natural disaster. Of course, there are rules. First, you must itemize to claim this deduction. You can't also claim the standard deduction for your filing status. There are a few other requirements as well. This deduction used to cover a pretty wide-ranging set of circumstances, but that changed with the passage of the Tax Cuts and Jobs Act (TCJA) in December 2017. 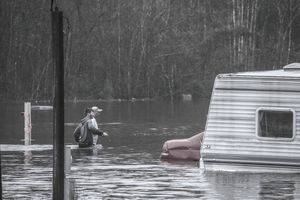 Beginning with tax year 2018 and through tax year 2025, you can only deduct casualty and theft losses if they're brought about due to an event that's been declared a disaster by the U.S. president. You can still claim these losses on your 2017 tax return, however, if you amend it—even without a presidential declaration. Progressive deterioration is damage that steadily occurs over an extended period of time. Damage caused by termite infestation, dry rot, and wet rot are all examples of non-deductible progressive deterioration losses. The damage must have been caused by a sudden event, such as a natural disaster. It's unlikely that any type of infestation would qualify going forward from 2018 through 2025 either, because it wouldn't meet the rule that the U.S. President must declare the situation a disaster. Again, beginning in 2018, the theft must have occurred due to a presidential disaster area declaration. In 2017, you might have had a theft loss if you were the victim of blackmail, burglary, embezzlement, extortion, kidnapping for ransom, larceny, or robbery. So how would this work under the terms of the TCJA? Let's say that a hurricane strikes your hometown, and the president declares that it's a disaster area. But, miracle of all miracles, your vintage car sustains only minimal damage because it was tucked safely away in a garage that was built to withstand hurricane damage. All is well and good...but then a thief takes advantage of the fact that one of the garage windows was broken in the storm. He's able to gain entrance and make off with your car. The theft and the disaster were related so you might possibly make the argument that the theft was deductible. Property that's been mislaid or lost is not a theft and is generally not tax-deductible, not before the new tax law took effect or in 2018. Your loss might have qualified as a casualty loss in 2017, however, if you lost property because of a sudden, unexpected, and unusual event. "A car door is accidentally slammed on your hand, breaking the setting of your diamond ring. The diamond falls from the ring and is never found. The loss of the diamond is a casualty." If you lost money in 2017 or earlier because your bank became insolvent, your loss might have been either a casualty loss or an ordinary loss. You might be able to claim a casualty loss if your deposit was with a bank, savings and loan association, credit union, or other financial institution that was a federally insured. If your deposit was not federally insured, you have an ordinary loss and this would be reported somewhat differently on your tax return. You would still have to itemize to claim it, but it would be a miscellaneous itemized deduction on line 28 of Schedule A rather than on line 22. And again, the TCJA rule prevails from 2018 through 2025. The situation must be the result of a disaster declared by the president. Casualty and theft losses are limited to a $100 threshold per loss event and an overall threshold of 10 percent of your adjusted gross income (AGI). Losses do not include any property that is covered by insurance if the insurance company reimburses you for the loss. Let's say that John suffered two losses last year: his uninsured laptop computer was stolen and later an earthquake caused damage to his home. Each event is subject to a separate $100 limitation. If his stolen laptop was worth $1,500, we would have a loss of $1,400 after allowing for the $100 per loss threshold. The same would apply to the damage to his home. These rules changed somewhat, too, in 2017 and 2018, at least for some taxpayers. Victims of Hurricanes Harvey, Irma, and Maria were subject to more lenient rules under the terms of the Disaster Tax Relief and Airport and Airway Extension Act of 2017, signed by President Donald Trump in September 2017. In addition to several other tax breaks, these victims could disregard the 10 percent of AGI rule, and they could claim a deduction for damages without having to itemize. The Bipartisan Budget Act of 2018 further extended these provisions to victims of the California wildfires if they suffered damages or losses from Oct. 8 through Dec. 31, 2017. Casualty and theft losses are first reported and calculated on Form 4684, Casualties and Thefts. You can then enter the resulting number on Schedule A when you itemize, along with all your other itemized deductions, then transfer the number from Schedule A to line 40 of the 2017 Form 1040. The line of the 1040 is expected to be different, however, beginning with the 2018 tax year. The IRS has revised the 1040 effective the 2019 filing season.